Based on feedback from scores of anglers, we have fine-tuned this model for superb performance under very specific conditions. The excellent specific performance of the Tide-Minnow Advance Line comes at a slight cost to certain other performance characteristics. 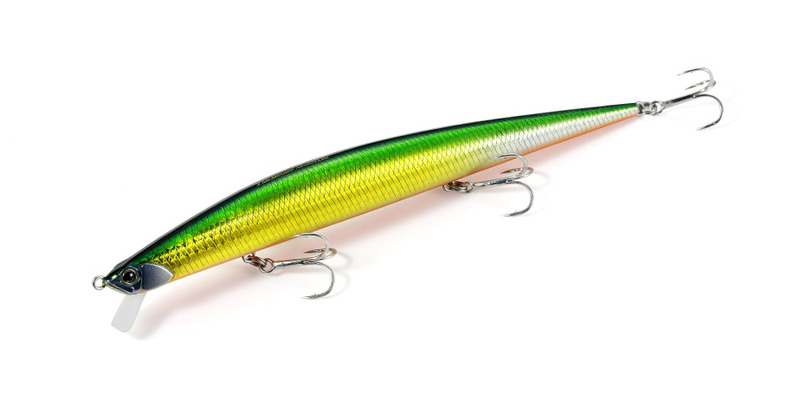 The Flyer 175 is a sinking model created based on the Tide-Minnow Slim 175 with special attention paid to its casting capabilities. This lure shines in the roughest weather conditions, as its large body size creates exceptional ability to cast long distances and attract the attention of fish. Rig up the 175 Flyer when no other lure can be used. We have changed the moving weight from steel balls to higher density tungsten balls. By doing so, we have extended the casting distance compared to the original model, which already had a reputation for its great castability. Use a powerful rod and you will be able to experience a distinct difference. 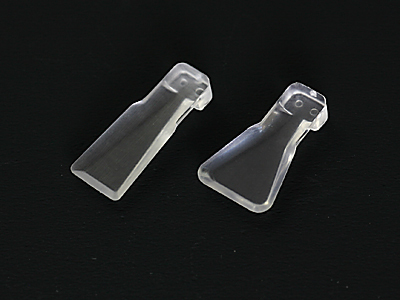 With the increase in weight, the lip was redesigned to prevent a substantial change in the action response. 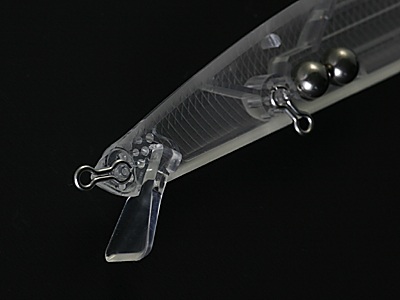 Compared to the original model, this lure features a stronger “wobble & roll” action. A wider lip catches the water more, making the heavier body swim sufficiently in heavy conditions. The moving weights were changed from a 7.0mm tungsten ball + a 7.0mm steel ball to two 7.0mm tungsten balls. The lure is manufactured from three separate pieces which are bonded together. 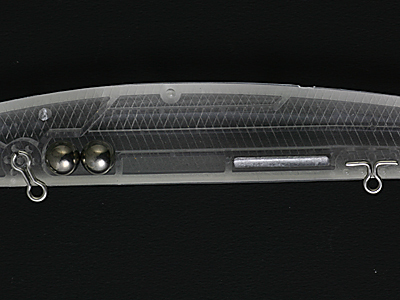 This enabled us to use a thinner lip, creating the lure’s special action, while also increasing the strength of the lip. The wider lip specially designed for the Flyer is pictured on the right. A wider lip area is required to effectively move the heavier body of the lure.